Alaska Republican Sen. Lisa Murkowski's amendment to require comprehensive analysis before genetically-engineered salmon enters the American marketplace was narrowly defeated by the U.S. Senate Thursday with 46 yes votes and 50 votes against it. The senator said afterwards "that the numbers are trending towards a greater wariness of the risks and potentially dangerous consequences involved - along with the thousands of Alaskan and American jobs lost in the process." 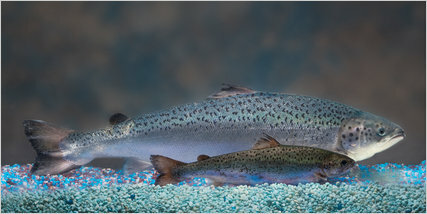 The amendment to the Food and Drug Administration Reauthorization Bill would require the same comprehensive scientific and economic analysis be done by the National Oceanic and Atmospheric Administration for genetically modified salmon as is done for any other federal fishery. "While I am disappointed with today's vote, I am heartened by the fact that a growing number of my colleagues are hearing my concerns and agree that 'test tube fish' are an unknown that need greater scrutiny," said Murkowski. "I will continue making this case for our fisheries and our food safety." Immediately prior to the vote, Murkowski pressed the amendments benefits to her colleagues on the Senate floor, saying "the Food and Drug Administration is not looking at labeling these fish, the FDA is not considering the environmental impact of escapement into the marine environment. What we're asking for in this amendment is as the FDA proceeds with its process, that the agency (NOAA) with oversight of our federal fisheries be allowed to participate and weigh in with the environmental consequences that may come about." In a speech during floor debate of the FDA bill, Murkowski laid out the case against "Frankenfish" - from the scientific concerns to the nutritional uncertainty to Alaskan jobs lost to Canada and Panama. "You're going to see these fish breeding year round. You're going to see them eating year round. This means competition with the wild stock - they will compete with one another for the food supply the species feed on. They'll wreak havoc on the ecosystem. You are introducing a fish into the ecosystem that just doesn't work with our wild stock," Murkowski said. "This could have devastating impacts on our fish industry and the jobs it supports at a time we can't afford it. Some will say 'this is a new industry, it will create jobs' . . . one of the things I find interesting is that this company is going to produce the salmon eggs in Canada. Then they will send them to Panama where they will be grown and processed. Then they will send the fish back to the United States for resale. So we get all the harm and none of the jobs."